KoopaTV: Dos and Don'ts: Club Nintendo's Last Rewards! By LUDWIG VON KOOPA - My recommendations of that catalogue. I got 700 Club Nintendo coins to use until June 30th, and I have no idea what to use them on. For your collective sake, dear readers, perhaps I'll dedicate them to KoopaTV-related prizes. But I kind of want to enjoy myself, too. So let's check out Club Nintendo's grand finale! I can tell you what to get and what to avoid. ...If we can get in. 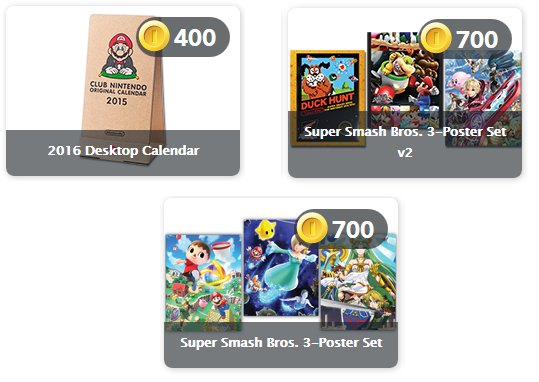 2016 Desktop Calendar and Super Smash Bros. 3-Poster Sets. You'd love to have these in your room. I can personally attest to how cool those calendars are, having gotten several of them with my Gold-level statuses. I keep 'em on my dresser as the only non-digital calendar there, and it's great to wake up in the mornin' with Nintendo characters greetin' you while you know what day it is! There are 12 cards for each month and each card has two sides and it's nice. Those posters are of the official artwork you see on the Super Smash Bros. official website for the newcomers. They look cool. Personally verified to be the best games there. That's Yoshi's Island: Super Mario Advance 3, Doc Louis's Punch-Out! !, Paper Mario, Punch-Out!! : Featuring Mr. Dream, EarthBound, and Kid Icarus: Uprising. We've endorsed some of these games over and over! Is being made in America supposed to explain the "Black image on Black Canvas" stupidity? That's the "Fierce Deity Link Jigsaw Puzzle" and "The Legend of Zelda: Majora's Mask 3D Messenger Bag". If you're a big Majora's Mask fan, it doesn't matter. Both prizes waste potential. That amazing artwork with Link and the bosses? It's wasted on being a JIGSAW PUZZLE. See, THAT should be a poster. ...As for the bag, it's self-explanatory why that's stupid. 700 coins is the most coins they're asking for any game. You can pay the most amount of reward coins possible for one of the most disappointing experiences possible! Paper Mario: Sticker Star killed the Paper Mario spirit. It brought a split community together, united over how bad the game was. 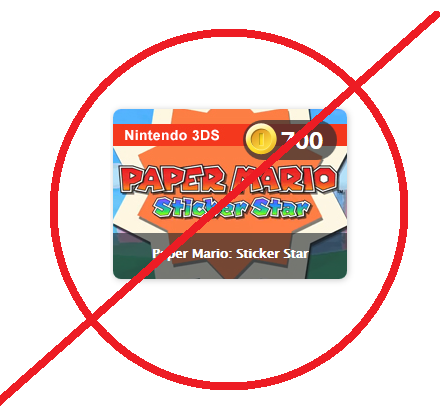 The idea that it is valued as the best possible game you can get is absolutely ridiculous, and shows how out-of-touch Nintendo is about how Paper Mario: Sticker Star is a failure of a game. Remember what one of the developers said? "We worked hard so that this game would become the new standard for future Paper Mario games[.]" If these Club Nintendo rewards are any indication, then it looks like they're still on that path! Oh, um, also, don't get F-Zero X. I can still give that code for free to one person. The Wii U port is 200 coins, the Wii port is 250 coins. 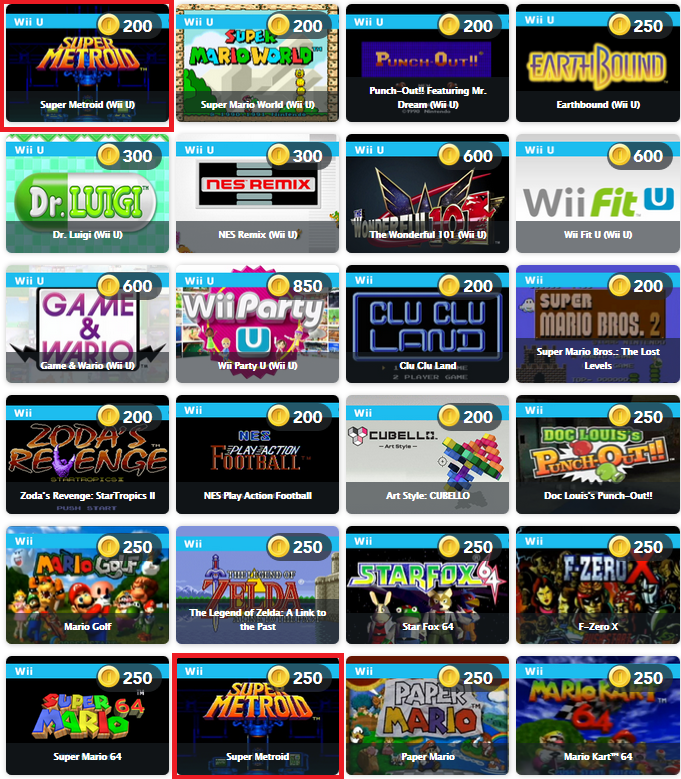 Super Metroid shows up twice in the list. If you want it on Wii, it's 250 coins. If you want it on Wii U, it's 200 coins. The Wii U version has restore points (instead of just quick-saves) and Miiverse functionality where you can wonder why Metroids (or what you believe to be a Metroid) cannot crawl. It's obviously better in every way than the Wii port, so why the difference in pricing...? Well, I still don't know how to spend my 700 coins. Maybe get the calendar and offer up to 300 coins on a KoopaTV prize? Save it all for you? Dump it all on posters? Let me know! Leave feedback for Ludwig on how to use his reward currency! If you would like to chime in on games you think people should get, or should avoid, or have an objection to Ludwig's picks, feel free to comment! The KoopaTV Rewards Program is how Ludwig's stuff will be given away. That's right: He gets nothing. You get everything! Paper Mario gets another recommendation, this time for an epic E3 sale. 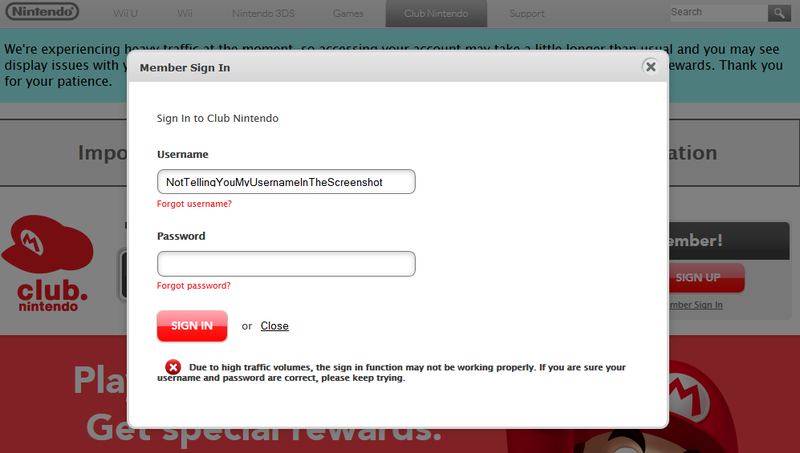 Just to clarify, she is not recommending anyone get Sticker Star for the sole purpose of the Club Nintendo survey. ...Though giving something to "Anonymous" sounds difficult. The Wii U can access Wii mode, go to the Wii Shop Channel there, input the F-Zero X code, and then play it. I mean, you get the opportunity for free stuff, so yeah. You're heavily encouraged to check out KoopaTV's contents in the mean time! We're an entertainment website, after all. ...'kay it's up go look. I'm just a girl who likes games, though I'm not sure how exactly you want me to answer your question. Well, if I'm giving things away, it'll likely be via a contest on KoopaTV, so stay tuned to KoopaTV! ...And we'll be much happier to accommodate you if you try to become a "regular" on the site instead of just lookin' like a carpet-bagger. See our About page here for more information on us. If you have any codes or coins left over, could I have them? Also, I'm stuck between a poster set and some games. You cannot transfer coins between accounts. OK and what should I pick? I was thinking Wii Fit U and NES Remix. ...If I had to choose between those Smash posters vs. Wii Fit U and NES Remix, I'd pick the posters. But obviously, you probably have a much more favourable inclination towards those games than I do. So why you interested in Wii Fit U and NES Remix? I mean I kinda feel like by getting the games I'm able to do more on my Wii U but I really like the posters and they would look cool in my room. They would look cool in my room, too. I used to have several posters in my room for about a decade until they fell on me while I was trying to sleep. If you want to do more on the Wii U, perhaps you're looking for games that will last you the longest? As in, give you the most playtime? In that case, I'd lean towards Super Smash Bros. 4 (in general... it's not a reward here) and RPG games like Golden Sun and EarthBound. I have Smash Bros., but I thought of something. I will probably have 900 coins when I am done registering the rest of my codes, so should I get the posters and a game? If so, what game should I get? So a 200 coin game? Specifically on Wii U? Depends on your favourite genres and if you've played it before. If you've never played Yoshi's Island before and you like sidescrolling platformers, get Yoshi's Island. Golden Sun is a classic RPG from the Game Boy Advance, and Punch-Out!! is one of my favourite games that is basically an action-puzzler. You can get a feel for it by playing Trayvon Tyson's Punch-Out!! when you are not on a mobile phone (you'll need a keyboard and flash player) right on KoopaTV, since we developed that game. Do they have any Mega Man titles as a reward? The Wii U has like, the majority of the Mega Man titles published on the NES, SNES, and GBA by now on the Virtual Consoles. With Mega Man in mind, what of the available games should I get? And, which poster set? The poster set is totally dependent on your preferences. I'm leaning towards liking the Villager-Palutena-Rosalina one more, despite me actually being in the Duck Hunt-Koopalings-Shulk one. The most (classic) Mega Man-like game on the catalog? Well, there's Super Metroid, but that's only Mega Man-like in that you jump and shoot. The later Mega Man games, along with the X series, actually do have collectibles that you can get by going back to the stages with certain weapons, like having the fire weapon to burn down a forest to get an upgrade. That type of gameplay is what Super Metroid is all about. Super Metroid has a massive world (no "levels"), unlike Mega Man which has a stage select. Yeah, there isn't a good answer to that. OK, I'm gonna go with Super Metriod and toss a coin for the posters. Thanks so much for your help , and you are the variant I will use in Smash. Also, I'll link you to a video where I show the posters when I get them. ...Oh, I thought you had Wii U Smash. ...You can send me a friend request at NNID PrinceOfKoopas. Sorry about the spam. My phone was messing up and sent it off three times. It's okay. I have a magical delete button. Thanks for the comment, and good taste with Yoshi's Island. What is exactly wrong with the messenger bag? I think it would be cool to put my laptop in it or something. You literally cannot get worse than that. If you just want a bag, fine, but you'll have to actually try to see that there is even a design there.